According to Bloomberg, at the same dealer meeting where our source told us what to expect from the new NSX concept, Honda also introduced a sedan intended for younger buyers unable to afford higher-end models. It's part of an effort to improve Acura's image with the youngs. The compact ILX — which'll be based off the Honda Civic (so, think something like the Acura CSX in Canada, pictured above) — will be aimed at "Generation-Y" drivers turning 30, Honda reportedly said at the briefing in Las Vegas. The sedan will start "well under $30,000" when it goes on sale in early 2012, and will be shown next month to the public at the Detroit Auto Show, said Vicki Poponi, assistant vice president for product planning at Honda's U.S. unit. Acura also will unveil a prototype of the 2013 RDX at the big show. 2nd Gear: Oh, Wait, Honda Will Be In Detroit For The Auto Show Too! In addition to the Acura reveals, Honda will also attempt to shift some of the Detroit Auto Show attention to the poppa brand when they unveil the new 2013 Accord Coupe Concept at next month's big show. The new concept will supposedly, according to their press release, preview a new aggressive and dynamic styling direction for the new Honda Accord Coupe which the Japanese automaker has confirmed the model will begin selling next fall. No further details have been revealed, but if the tea leaves we've been reading turn out to be true, then we should expect to find a plug-in hybrid system and a 2.0-liter four-cylinder gas engine. The power output is rumored to total 161 hp and will allow the two-door Accord to drive 15 miles on electric charge alone. The last Ford Ranger for the U.S. market is expected to roll off the line by the end of this week, marking the end of an era, with more than 6.6 million sold over 29 years. Detroit News auto critic Scott Burgess reminds us this morning that if the Ford Ranger ever underwent an autopsy, its death certificate would absolutely read "neglect." That's because the business case for the Ranger no longer makes sense, given that the Ranger is pretty much seen as a little F-150. And why would you spend $20,000 for a Ranger when you can buy an F-150 for less than that? And for the majority of Americans, that's all the justification they need. Because everyone knows that there's no negative to selecting the "Super Size" option, right? 4th Gear: Cadillac ATS Unveil Coming Day Before Detroit Auto Show GM said Friday it will reveal the 3 Series-fighting Cadillac ATS sedan with a big party at Detroit's College for Creative Studies on January 8th — the night before the Detroit Auto Show opens to the media. We'll be there — so you will be too. 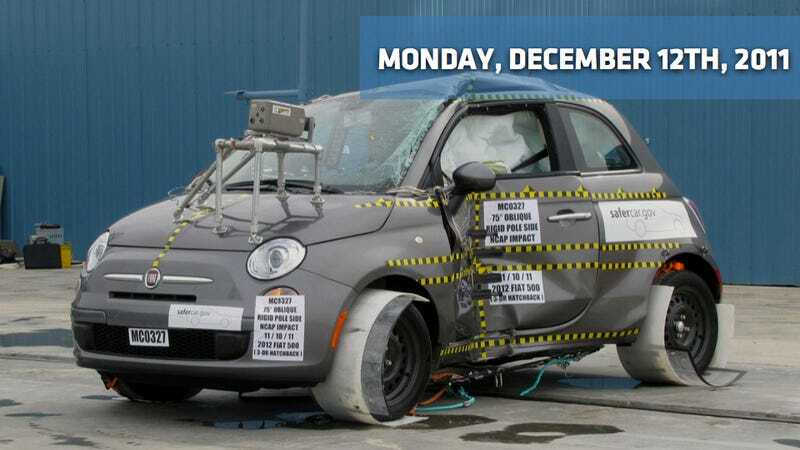 The Fiat 500 has now received conflicting safety ratings from the two main organizations consumers look to for vehicular safety. Last week, the two-door subcompact received a three-star safety rating out of a possible five stars, the lowest rating for 2012 models tested so far, from the National Highway Traffic Safety Administration. This comes after the car was named a top safety pick by the Insurance Institute for Highway Safety back in October, which conducts crash tests on behalf of the insurance industry. The 2012 500 received four stars from NHTSA for frontal crash and rollover accidents but received just two stars for side-impact crash safety for a combined overall rating of three stars, the agency announced on its Web site, safercar.gov. The IIHS gave the vehicle its top rating of "good" in all its categories. Confused? It all comes down to barrier height — which differs between the two tests — and it's why consumers, if they're looking at safety results, should look at both sets of tests before making a decision on what car to buy. Reuters reported on Friday that Ford has recalled almost 129,000 of its Mercury Milan and Ford Fusion sedans in the United States because their 17-inch steel wheels may fall off, according to U.S. safety regulators. What happens is that in some vehicles from model years 2010 and 2011, the wheel studs may fracture and make the car shake. If ignored, the wheels may fall off a moving car, the National Highway Traffic Safety Administration said in a website posting. The issue may stem from wheel mounting pads or rear brake discs that have been incorrectly built and cannot support the wheel. The sedans were all built at Ford's Hermosillo stamping and assembly plant in Mexico in April 2009 and from December 2009 through Nov. 13, 2010. And yes, if you ignore the wheels falling off your car while you're moving, it may, in fact, lead to your fiery death!